Realizing that families have different abilities to pay, Camp Gravatt has instituted a voluntary three-tier fee program. You may choose the tier that is most suitable for your family. It is really an honor system; you tell us what is affordable for your family. All campers receive the same Gravatt experience no matter what they pay. For those families who can not afford Tier 1 additional financial assistance is available to ensure that all children have this wonderful opportunity to attend camp. In addition, some families use this system to give themselves a multi-child discount. Register for all three Elementary sessions or All Ages 1 and Junior High sessions and receive $150 off the total registration fee, skip the line at registration, receive a free special t-shirt, and receive a deep discount on All Ages 2 if desired. • Tier I - Partially Subsidized. This is our historically SUBSIDIZED rate and does not reflect the true cost of operating summer camp programs. This is the rate you have always paid. This reduced rate is made possible through the mission funding dollars we receive from individual donors and churches who value the impact that the summer camp experience at Camp Gravatt has on children, youth, individuals, and families. This rate makes the camp experience available to more families. Tier II - Direct Cost. This represents the DIRECT cost of camp. 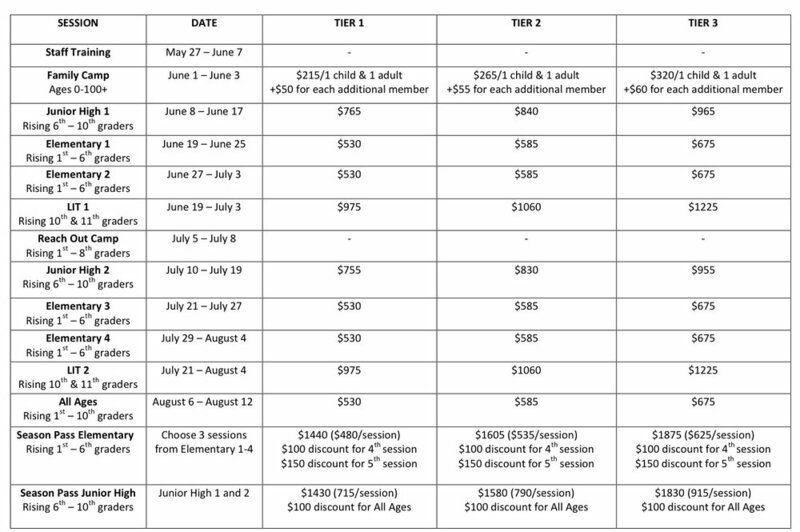 Direct costs include program costs, food, summer staff, and camp administration cost. Tier III - True Cost. This rate more closely accounts for the TRUE costs of camp. True costs include all direct costs plus deferred maintenance, insurance, utilities, etc. Choosing Tier III gives you an opportunity to help us do more with the donor funding we receive. You help us stretch our limited scholarship funds further so more children can experience the power of camp. You help Gravatt make needed upgrades and continue to grow in the future. • To provide high quality, safe, fun, and inclusive activities for all God’s children in the midst of God's creation. • To build a diverse Christ-centered community where every person is valued. • To provide an opportunity for partnership with those who value the impact of Camp Gravatt's ministry. • To preserve Camp Gravatt for generations to come. We are grateful to our donors for investing in our campers and making it possible for us to offer a subsidized rate as well as scholarships. Again this program is voluntary and in no way influences the experience children receive, yet it offers the opportunity for families to take an active role in supporting the true cost of their child’s camp experience. Learn more about donating to Gravatt.